Not sure what to do with all that zucchini? These creative food bloggers have you covered with some mouth-watering and healthy zucchini recipes! 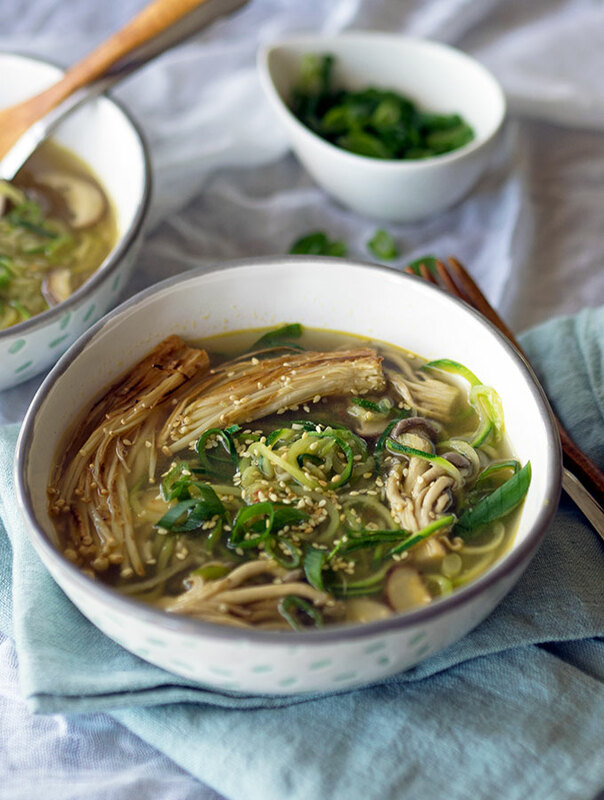 Whether you want to make a nourishing soup or some indulgent brownies, try these inventive uses for that ubiquitous summer squash. 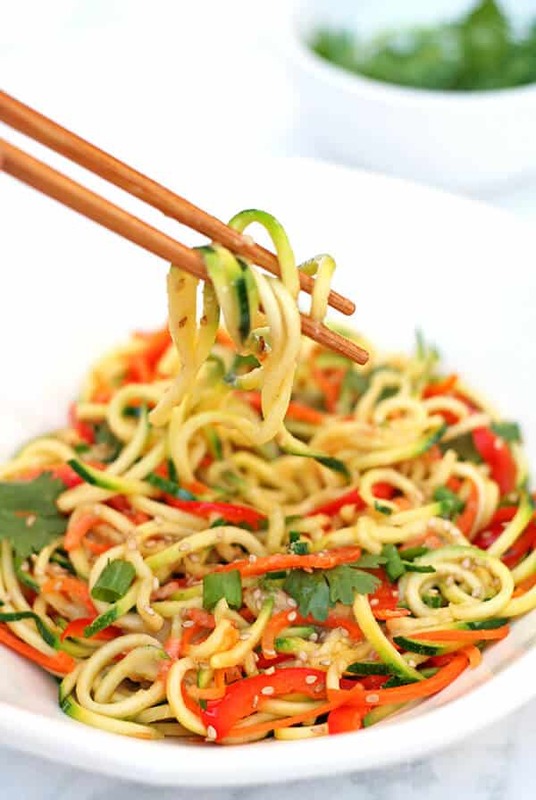 Read on to find your new favorite healthy zucchini recipes! If you’re reading this in summer, zucchini’s booming in the garden now — even if you don’t have a garden, you probably know someone who’s begging you to take some off their hands. Or leaving it on your doorstep in the dead of night. It’s also cheap and abundant at your local farmers’ market or CSA. Even at other times of year, zucchini’s usually a pretty affordable veggie. Though not exactly the most glamorous garden gem, zucchini is a versatile ingredient that can be used in a huge array of dishes — everything from soup to brownies! 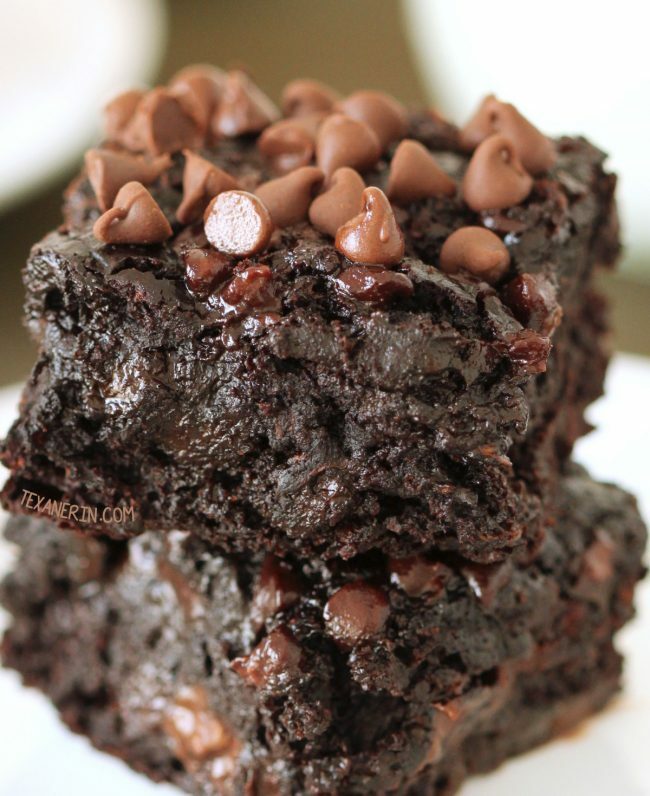 Yes, I said brownies! While you might not eagerly await zucchinis the way you do, say, ripe summer tomatoes, this humble squash works really well in a surprising number of dishes. Somewhat bland zucchinis lend themselves brilliantly to dozens of delicious recipes. Zucchini is a low-calorie, high fiber veggie with a decent amount of potassium. When possible, choose the freshest, firmest zucchini you can get but don’t sweat it if you’ve got some of the bigger types that escape our attention in the garden till they look like giant green torpedoes. Oversize zucchini can still be shredded up for baking, or tossed in dishes that will cook awhile, like this super-easy ratatouille. What to do with that bumper crop of zucchini? I asked some seasoned food bloggers for their favorite healthy zucchini recipes, and boy, do these gals know their way around zucchini! Check out some of their creative recipes for scrumptious zucchini dishes. Working our way from simplest to most complicated recipes (more or less), here are more than 50 heakthy zucchini recipes to put all that surplus zucchini to delicious use! Have you tried zucchini fries or crisps yet? They’re incredibly easy and really tasty — you’ll be scouting out more zucchinis to make these! There’s something about baking zucchini with a topping of cheese that concentrates the flavor and gives zucchini a terrific texture. You can bake them a shorter time for a succulent chip, or crisp up thin slices — it’s all good! 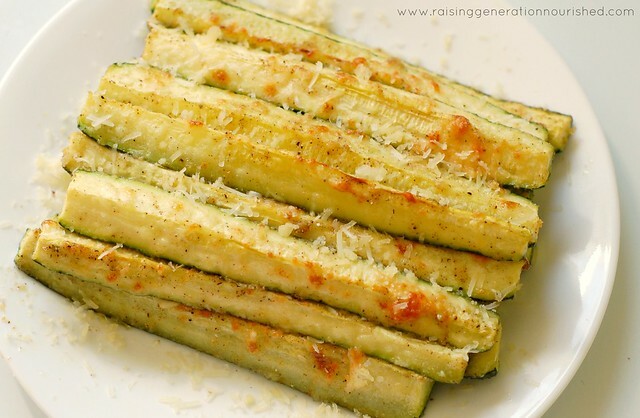 Raising Generation Nourished has a simple recipe for kid-approved parmesan baked zucchini spears. Recipes to Nourish makes garlic zucchini fries. I make these easy and yummy baked parmesan zucchini rounds from Five Heart Home often these days. Dehydrated zucchini chips make a crunchy and tasty snack, for minimal calories. Go ahead and eat ‘em all! Here’s a recipe for garlic and herb zucchini chips from This Is So Good. And It Takes Time has a recipe for turning zucchini into sour cream and onion veggie chips. Or try these lacto-fermented zucchini sticks from Learning and Yearning. Great for gut health! Food Hunters Guide has an apple-zucchini slaw that would be perfect for late-summer picnics. The Pistachio Project has an easy zucchini fritter recipe, and the Organic Kitchen makes zucchini fritters with lemon ricotta (with a gluten free option). Baked cheesy zucchini bites from Mel’s Kitchen and zucchini tots (“zots”) from Creative Green Living also feature the glorious combo of cheese and zucchini. Delicious Balance makes these yummy zucchini pancakes with lemon tahini sauce. Just Take a Bite makes adorable zucchini pizza bites and creamy zucchini egg muffins. Yum! Cooking Classy turns her zucchini into zucchini pizza boats. Sliced zucchini can also replace the noodles in lasagna! Check out this zucchini lasagna from Grow a Good Life, or this allergy-friendly zucchini lasagna recipe from Whole New Mom. You can even use zucchini in a grain-free pizza crust! Check out Mommypotamus’s recipe for zucchini pizza crust. Or try these homemade tortillas with zucchini from Sweet as Honey. Add some zucchini to your next pesto — here’s a recipe for raw vegan pesto from Small Footprint Family. The Rising Spoon makes her white chicken chili with zucchini. Or try this paleo tabbouleh made with zucchini “rice” from Forest and Fauna or Greek zucchini pie from Nutritioulicious. Just Take a Bite has a recipe for rustic chicken zucchini pie. And of course, don’t forget ratatouille, that quintessential summer dish combining eggplant, tomato, and zucchini. Over pasta with cheese (or even without!) ratatouille makes a delicious meal. Ratatouille freezes well, so if you make big batches, you can enjoy these delicious summer flavors in winter. Related: Health Benefits of Sweet Potatoes and Delicious Ways to Enjoy Them! So many tempting ways to use zucchini — I’ll bet you have trouble deciding where to start! What are your favorite healthy zucchini recipes? If you love the idea of making healthied-up desserts with veggies like zucchini, check out this homemade fruit leather made from rhubarb or easy rhubarb crisp. Putting inexpensive veggies to delicious use is just one strategy for eating healthy on a budget. Find lots more in my FREE guide, Affordable Healthy Food. Pin to save these healthy zucchini recipes for later! So many great ideas! We picked up 25 cent zucchinis this week! I can’t wait to use them up! Renee, your family’s repertoire of zucchini recipes is awe-inspiring — I know they’ll get put to good use! This is great! I need to try some of these recipes. My zucchini plants have all basically given up, so last week I bought zucchini at the farmers market, because there just hasn’t been enough zucchini this summer! Great round-up! I pinned it 🙂 Thank you for sharing with us on the Art of Home-Making Mondays at Strangers & Pilgrims on Earth!